What loops should be threaded and vectorized first? Does this loop have a dependency that prevents vectorization? instructions? Or are you using older SIMD instructions? Intel® Advisor is a dynamic analysis tool that’s part of Intel® Parallel Studio XE, Intel’s comprehensive tool suite for building and modernizing code. Intel Advisor answers these questions―and many more. 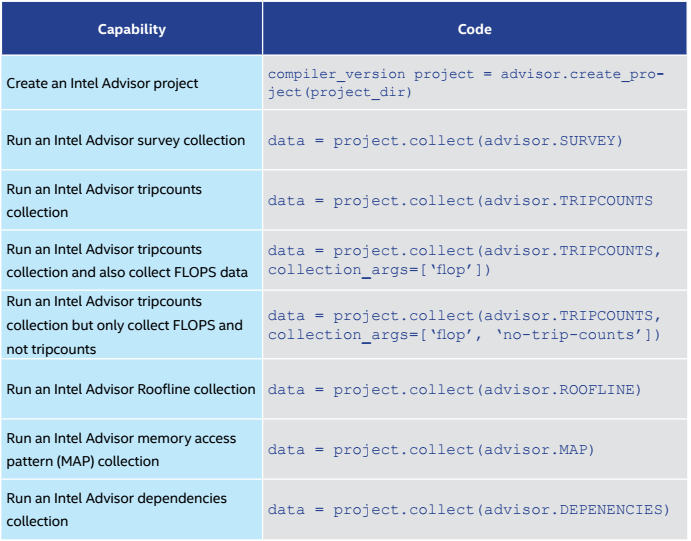 You can collect insightful program metrics on the vectorization and memory profile of your application. And, besides providing tailored reports using the GUI and command line, Intel Advisor now gives you the added flexibility to mine a collected database and create powerful new reports using Python*. When you run Intel Advisor, it stores all the data it collects in a proprietary database that you can now access using a Python API. This provides a flexible way to generate customized reports on program metrics. This article will describe how to use this new functionality. To run a map or dependencies collection, you need to specify the loops that you want to analyze. You can find this information using the Intel Advisor GUI or by doing a command-line report. The reference examples we’ve provided are just small set of the reporting that’s possible using this flexible way to access your program data. You could use the columns.py example to get a list of available data fields. For example, you could see the metrics in Table 1 after running a basic survey collection. Here are some highlights of our various examples. We are constantly adding to the list of examples. 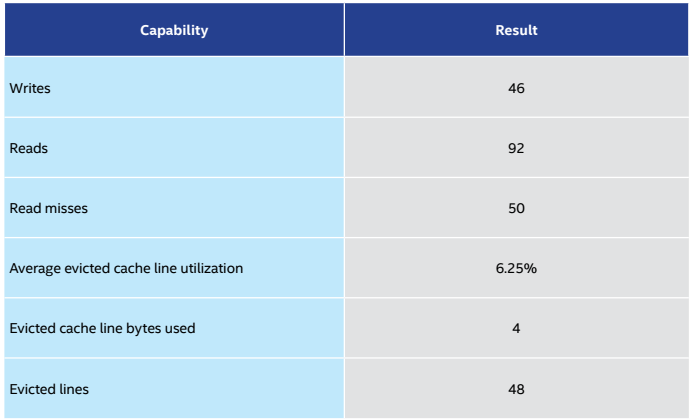 You can see the results we obtained from the cache model in Table 3. 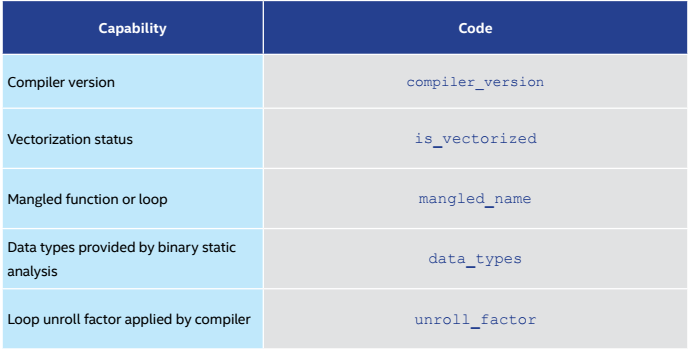 In this case study, we create a Python script that can compare the vectorization of a given loop when compiled with different compiler options. First, compile the app with different options. In this example, we use the Intel® C++ Compiler (but Intel Advisor works at the binary level, so any compiler should work). In the first case, we are compiling without optimization using the compiler option -O0. The second case uses full optimization -O3. The script is very simple. First, get some arguments from the command-line. If they are being passed an Intel Advisor project, then use the data contained in the project. Otherwise, do an Intel Advisor survey run. Once the survey runs complete, decode the assembly for the loops and print the instructions of the two loops side-by-side. The main function in our Python code is named get_formatted_asm. This function is able to access the Intel Advisor database and decode the assembly for our loops. It can also check whether the assembly code is using vector instructions, as well as how fast the loop executed. project_dir1 = project_dir + ".1"
project_dir2 = project_dir + ".2"
isVectorized = "VEC" if "VECTORIZED" in instruction['instruction_type'] else ""
Design and optimize high-performing code for modern computer architectures. 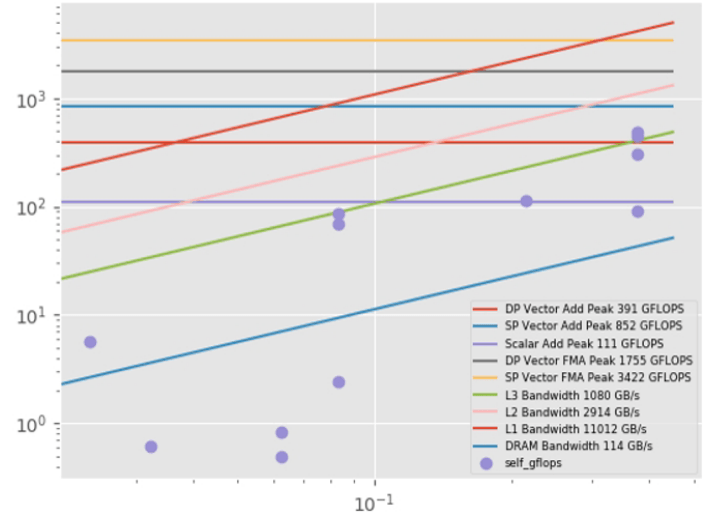 Effectively use more cores, vectorization, and heterogeneous processing.